Once again teachers will descend on the state capital to call for more public school funding, Medicaid expansion, and a $15 minimum wage for all school workers. 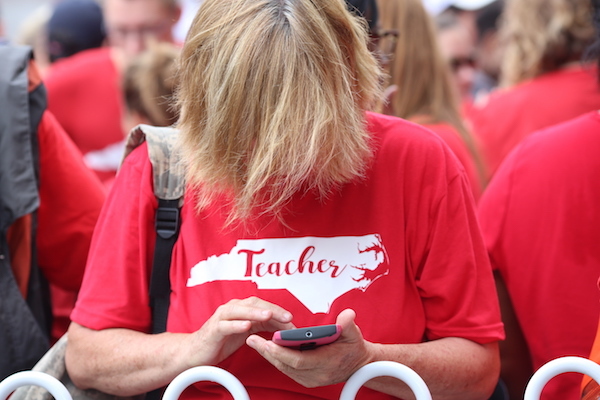 The North Carolina Association of Educators, in partnership with several other advocacy groups, is planning a teacher march May 1 in downtown Raleigh. Because so many teachers have requested time off, some school districts have announced plans to make May 1 an optional teacher work day. On April 8, Durham Public Schools announced its intention to cancel classes. More than 550 teachers have asked for time off for the start of May. Chapel Hill-Carrboro City Schools and Lexington City Schools are also canceling classes for May 1.